We’ve seen special pencils aimed at optical and electro-mechanical mark recognition – the vintage IBM Electrographic, and the more recent Musgrave Test Scoring Pencil. 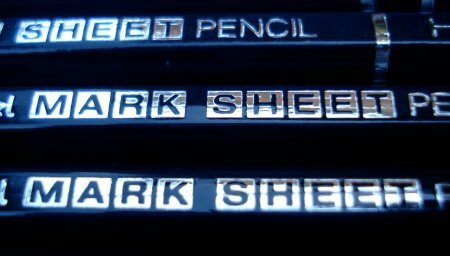 Quite a few people seem to be interested in these pencils, so I’m pleased to be able to mention a superb modern example that I recently learned about – the Pentel Mark Sheet pencil. This hexagonal pencil is finished in blue with silver lettering. Two grades exist – HB, which has an orange cap, and B, with a red cap. The lead is just superb – at the pinnacle of modern graphite quality. The pencils leave extremely dark, rich lines. There is often a crumbling issue when a pencil’s graphite saturation reaches this level, but these pencils have no such problem. It would be hard to imagine a better performing pencil. Do you know if these pencils are going to be sold in the North America? And if they are going to be sold in Europe? But also I have a question about the last remark: “it would be hard to imagine a better performing pencil.” Is that any pencil, so including the FC 9000 and the other nice pencils? or is it the best Mark Sheet performing pencil? I couldn’t find them in Google. Thanks again for such a nice review, I really like them! Sorry, but I am not privy to Pentel’s plans. These pencils were sourced in Japan, but we can hope they will be made more widely available. Alec, I used the term ‘performing’ because the lacquer, though very nice, may not be as rich as that of the top Japanese pencils. But the lead, which some Japanese language explanations seem to indicate has a higher concentration of graphite, writes extremely smoothly leaving dark non-crumbling marks. Though aimed at marking the rectangles of a scanned test card, it doubles as a great general pencil. And yes, the leads seems to me to be much nicer by many criteria than that of the Castell 9000. Tnx for the reply, now I’m really curious how they write. I have the No.V pencil from Graf von Faber-Castell. the lead is about the same as the 9000, but the pencil is just a bit thicker and rounded, which I happen to like. These pencils are indeed exceptional. I would like to add that there is also a matching eraser, namely the Pentel Mark Sheet eraser. it is quite soft and works very good (at least for me). The mchanical variants of the Mark Sheet pencils with 1.3mm lead (HB, B) and the leads for them seem to be no longer available. There is no doubt that the Graf von Faber-Castell pencils are in a separate league in terms of design and presentation. I have written about them before, and love the products. But a pencil’s graphite core seems to be more a matter of technology than design capability, and the Japanese manufacturers similarly seem to be in an elite category in terms of graphite quality. Or maybe it isn’t the advanced technology, and they are just willing to spend more on this component? i.e. others could make pencils that write as well as those of Pentel, Mitsubishi, and Tombow, but don’t choose to? I’ve always liked Pentel’s super hi-polymer leads more than any other brand. So putting their polymer leads into a wood cased pencil is a dream come true for me. Unfortunately these high quality Japanese pencils are pretty much impossible to find. Luckly though my somewhat local art shop claims on their website to sell Tombow Mono Professionals. However when I went into their shop they didn’t have any in stock, I’m not even sure if they’ve ever actually stocked them either. I think they can order them for me if I want. It is of course possible to buy Tombows online which is what I’ve done in the past. I’d just be really happy to see these quality pencils somewhere were I could buy them in person. That would be sweet. Just wandering how these Japanese pencils would be, could I compare them as the Lead from Caran d’Ache in my Yard O led with a high quality woodcase? The (polymer?) leads from Caran d’Ache are a tad smoother than FC 9000. Or is the Pentel/Mitsu-Bishi lead even more smooth? Is there a reason why FC and the other European companies doesn’t want to make those leads, other than a pricepoint? I can’t come up with anything else than a pricepoint, because at € 7 (yup $10,50) a pencil, you could cover it with 24K gilding and still make a profit out of it. As I have shown before, I really like GvFC, but not to the point where I stop being critical. There is no competition from any other pencil for the FC9000 and you really have to look very good to find those. Is there any way to get a hold on these Pentel’s in Europe? I would really like to have some of them. Thanks for your message. I have certainly learned something new. Yard-O-Led pencils use 1.18mm lead, and while older Caran d’Ache pencils used that diameter, I only just found that one can still buy 1.18mm Caran d’Ache refills, in both 33mm and 100mm lengths. What you will notice, in comparison to the Caran d’Ache 0.5mm and 0.7mm refills, is that the leads are not labelled as ‘polymer’. Rather, they would be composed of the graphite-clay-wax formula used by traditional woodcase pencils. Pentel makes polymer leads in 0.9mm and 1.3mm, but as far as I know, not 1.18mm. The precise difference between the leads used by mechanical and woodcase pencils is a large and interesting subject, but the exact details are in the realm of proprietary industry knowledge, as far as I know. Those of us on the outside just observe the products. One observation is that a lead like the Pentel Ain 0.9mm in 2B – is extremely nice by the standards often used in the woodcase pencil realm! So about pencils (woodcase pencils) – the Faber-Castell Castell 9000 has major European competitors in the Staedtler Mars Lumograph 100, and the Caran d’Ache Technograph 777, both of which perform similarly. Possibly others as well. I am guessing these firms aren’t as prominent in the Netherlands. So about pencils from Japan – in North America (I am in Canada), it is the animation industry in particular (pre-internet) that became aware of and embraced these pencils. 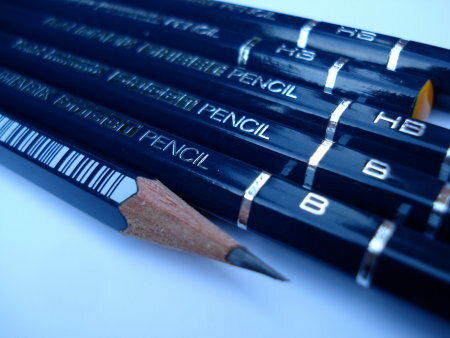 Different studios settled on different pencils, but the products of Tombow and Mitsubishi became known at the standards. Artists in particular (one linked in my ‘blogroll’) consistently confirm their view that these pencils are well beyond the quality of what one might find in most North American office and art supply stores. Enter the world wide web – eBay vendors, small online Japanese shops, plus reports of overseas Japanese bookstores in San Francisco, etc. made these pencils much more accessible to a much wider audience, including myself. No opinion I’ve heard or read doesn’t place Japanese woodcase pencil manufacturing at the peak of this industry, quality-wise. Everyone is of course welcome to decide for themselves. If anyone wants to start exploring Japanese pencils, I would suggest starting with the two standards – the Tombow Mono 100, and the Mitsubishi Hi-Uni. One-Stop-Japan-Shop and bundoki.com will ship these pencils globally. As to the why of it all – I can only speculate. With Staedtler and Faber-Castell pencils being $2.00 a piece where I live, and the cheapest no-name pencils being $0.08 or so – the business case to introduce a locally unknown (though acclaimed among specialists) pencil at the very high end, at a time when writing instruments are in decline, may be weak. Thanks for your continued contributions to the blog! Tombow evidently believes there is a need to mark seats as well as sheets. Frank, thank you. The wood used in pencils is a barely understood matter – but the graphite, clay, and wax are even rarer subjects. I appreciate the contribution on this topic. Barrel, thank you – some interesting pencils are shown in those photos! There is also a Mark Sheet pencil and a matching eraser by uni/Mitsubishi. The compound of the latter is very similar to that of the Pentel Mark Sheet eraser – currently I am using both and haven’t noticed any differences yet. I got this infomation from Japanese largest forum.